First things first, I hope you all had a lovely weekend and a happy belated Mother's Day to all of you moms out there! For Mother's Day I decided to make brunch this year. I had seen a delicious looking photo on pinterest (where else?) last week, a recipe for German pancakes, and was intrigued. My mom is a big fan of sweet breakfast foods so I thought she might enjoy this one. The recipe was simple with only a handful of ingredients and looked amazing. I don't know about you but I'm much more likely to try a recipe the easier it sounds. But then again, I'm also the kind of person that will pick the most complicated recipe in the book and tackle it for sport. I like a challenge. The most challenging part of this recipe was watching to make sure that it didn't rise too much. The recommended time was 15 - 20 minutes and I stuck too closely to what the recipe said instead of pulling it out the moment it turned the perfect shade of golden brown. Instead, I kept it in just the slightest bit longer than it needed to be and the pancake rose so much that it almost touched the top of the oven. Insert hand over face smiley here. I folded the edges down after removing it from the oven, that's why it looks the way it does. Next time, and there will certainly be one, it was too good to not make it again, I will move the oven racks a notch or two lower. Preheat the oven to 450°F and place the cast iron pan or baking dish in the oven. In a medium bowl combine the eggs, vanilla, milk, and salt until smooth. Stir in the flour and mix until incorporated, then set aside. Add the butter to the cast iron pan or baking dish. Once it has melted remove the pan from the oven and quickly pour the batter in. Place the pan back in the oven and bake until the pancake is fluffed and golden brown, about 15 minutes. 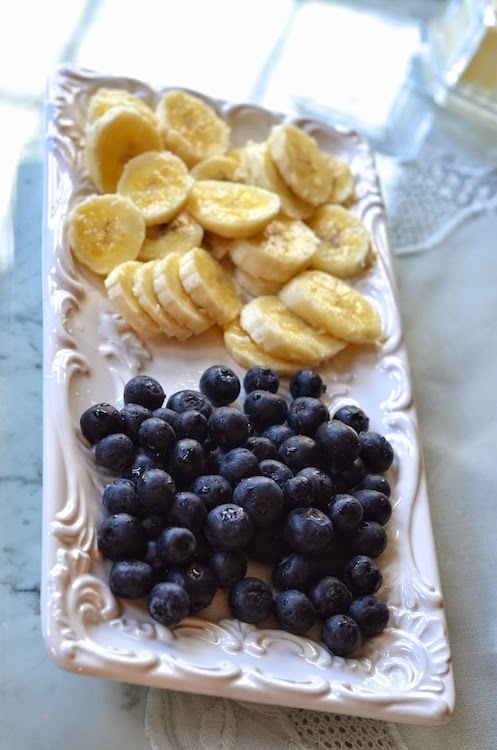 It's recommended to serve with powdered sugar and a little lemon juice but we went with maple syrup and fresh blueberries and banana slices instead. Serve with whatever you like best and enjoy!